There has been a lot of buzz about rising Milwaukee artist B. 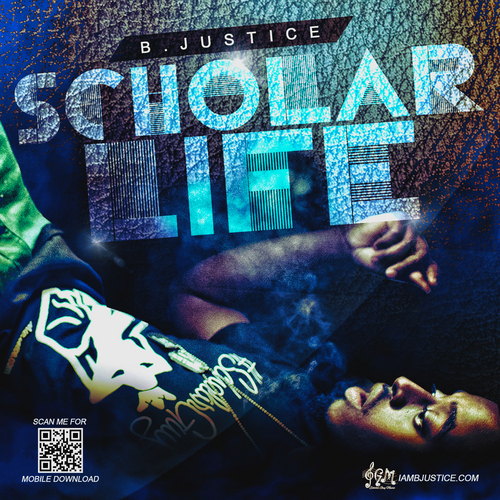 Justice and his new mixtape “The Scholar Life”. So when we were invited to his listening party to celebrate the May 1st release of the project, we were more than excited to attend. The exclusive, invite only party was held on April 26 at the Lincoln Warehouse in the Bay View neighborhood, which provided an intimate and eclectic atmosphere for the guests. The vibrant hand painted art work all over the walls and ceiling-to-floor length mirrors really enhanced the vibe of the space and the DJ was on point spinning hit after hit. Refreshments and finger foods were also offered to accommodate everyone in attendance and we were relaxed and enjoying ourselves as we anticipated hearing the mixtape. As more people came in to support and participate in the listening session, B. Justice began to introduce himself and everyone who he collaborated with on the mixtape. He also had personal comment slips for us to fill out that gave the title of each track, producers’ name, and who was featured on the songs. We were all instructed to remain anonymous and honest when filling out the slip which gave him the opportunity to take away some feedback for his own self-development. This was a nice and thoughtful touch as feedback is very important in strengthening your brand and maintaining an audience, so we appreciated his inclusion of our opinions. No Opponent – Here, B. Justice raps over a mellow beat and you can hear the hunger in his voice and words. As he talks about him “seeing no opponent”, he is still very humble in the midst of his braggadocio and it is clear that success the only option for him. I’m Chopped – The title is a pretty clear indicator of what this song is about. All the stoners will appreciate this one, the smooth beat and B. Justice’s flow is the perfect background music for a smoking session. Definitely a must-listen. Nights Like This – On this track, B. Justice shares his thoughts on his life, his career and his dreams and ambitions. When listening to it, we envisioned ourselves riding the city late at night vibing to this smooth track. 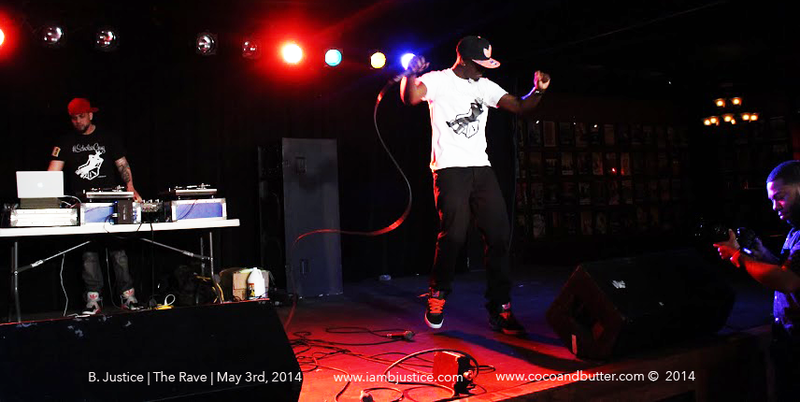 Coco & Butter: How long have you been rapping? B. Justice: Forever, since Kindergarden. Started after listening to LL Cool J.
C&B: What keeps you going? BJ: It’s the only thing I want to do. Whatever it takes: my energy and my money. I know I’m good at this and my number one thing is that I need people to hear it. Everyone sounds the same [so I’ll keep working] as long as it takes. C&B: What’s your favorite track on this new mixtape and why? BJ: “The Thirst” and that’s just because the beat and energy [of the song]. I had fun making it. The lyric delivery is crazy. The song that means the most is “This Is Life”. BJ: All of this isn’t a bunch of randomness. I just started smoking last year and fell in love [laughs]. It’s a time in my life; the past year on beats. C&B: What’s next for B. Justice? BJ: I have a show on May 3rd opening for Big Sean and I’m setting up a college schedule for next year, starting at UWM and UW-Parkside. I’m focusing on traveling. C&B: Where can we find your music? BJ: IAmBJustice.com sends you everywhere I am. We had a very good first impression of B. Justice after meeting with him; he was very open and comfortable during the interview and hosting the event. So, in addition to covering the listening party, we wanted to attend his performance at The Rave as well to get a full scope of what he had to offer as an artist. On stage B. Justice beamed as he never stopped interacting with the crowd and being charismatic. He definitely made his presence known throughout his performance which made him the most memorable of all the other artists who went before he graced the stage. No one else that night took the time out to be personable with the crowd like he did and it was definitely appreciated as the crowd continued to rock with him. We were very impressed with B. Justice as an all around artist: his content, stage presence, hunger and down-to-earth personality was very refreshing to experience. 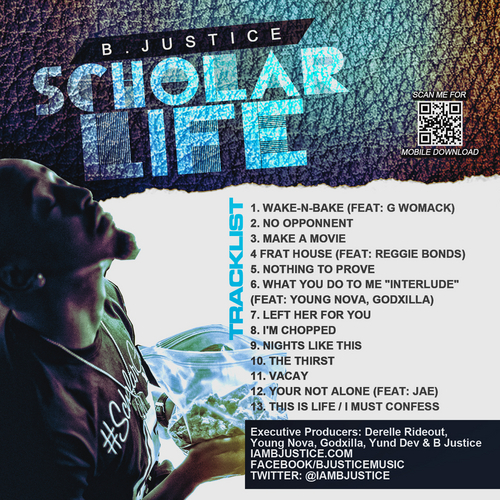 We especially love fact that he calls himself a “Scholar Guy” and emphasizes his intelligence; often rappers are misconceived as uneducated and ignorant but most times its the exact opposite and we are very happy that he chooses to promote this quality of himself. If he keeps up the hard work, stays humble and try to himself and his vision, B. Justice has unlimited potential and we will definitely be following him on his journey. Kudos on the amazing performance and music, and keep up the good work!